Colombo High Court today ordered garment factory owner Rollin M. Perera to pay Rs.2 million to President R. Premadasa’s daughter Dulanjali Jayakody as compensation for the mental and physical agony she underwent. Mr. Perera had paid back a loan obtained from Ms. Jayakody with 403 currency notes which the private bank where she had gone to deposit the cash found them to be a bundle of forged notes. 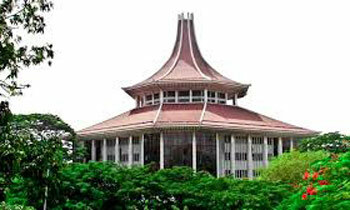 On pleading guilty to the charges, High Court Judge Gihan Kulatunga orderded Mr. Perera to pay Rs.1 million as compensation with one year’s imprisonment suspended for five years. He was also fined Rs.500,000 on the charges of possessing fake currency notes and carrying out a transaction with such currency notes. In default Mr. Perera was sentenced to another four years imprisonment. The CID arrested the suspect on a statement made by Ms. Jayakody that she had been give 403 fake 5,000 rupee notes by him which was detected to be so at the HSBC Cinnamon Gardens Branch. But why former logga MR said to media then that he saved her from not being arrested. Had the Police investigated well, then she would not have been arrested? What is our POLICE doing until 2 million forged notes are printed are they looking at the Moon!!!!! High time to use currency scanners when doing transactions with private individuals as there are lot of respectable rouges. Funny how all this happens in Sri Lanka. Funnier; what a lot of money; lucky madam; wonder how. This whole thing is fishy...from where did so many forged notes come from? Isn't this magistrate and police not investigating that? If the origin of the fake notes was Mr. Perera, then he should be firmly behind bars for at least 5 years instead of suspended sentences.